is now OPen until july 13th, 2019! Register for Summer Classes here! Since 1995, METdance has become a multi-functional dance organization that excels at entertaining and captivating audiences with it's professional company, instilling a passion and excitement for dance in its students, training the talented youth of Houston and preparing them for careers in dance performance, and inspiring many young children through the art of dance. METdance is currently in the 2018-2019 School Year programs for children ages 2 years to 12 years of age and our 2019-2020 Registration will open on June 1st, 2019! The METdance outstanding staff has gone through extensive Teacher Training this year and include the professional dance company members. All levels and requirements have changed to include the beginner student up to the most serious dancer. Please see below for your dancers age and program. Click HERE for METdance's Policies & Procedures. To Pay your tuition, please click here. Designed for dancers ages 2 to 6 years of age. Terrific Two's and Creative Dance classes, (ages 2 years to 4 years), will explore creative movements in ballet while gaining knowledge of music, coordination and movement. Primary Dance classes, (ages 5 and 6 years), will begin to focus more on the structure and discipline in each technique while enjoying the art and passion of dance. 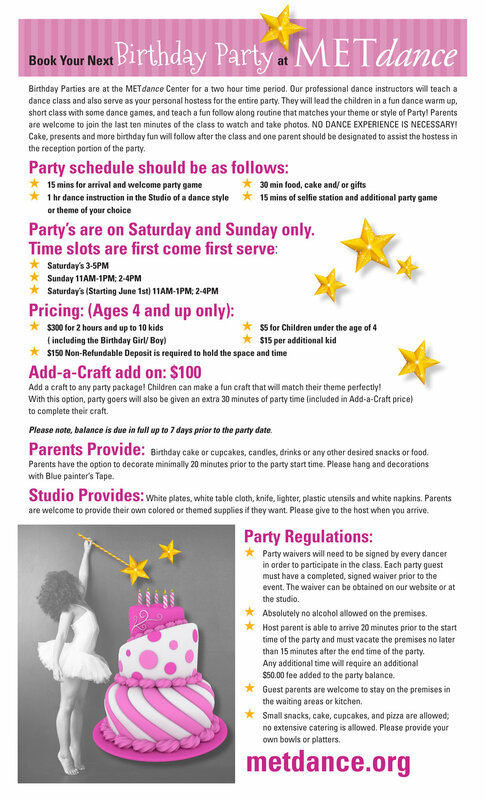 Designed for dancers ages 7 to 12 years of age. We offer classes for students, (ages 7 to 12 years), in Ballet, Tap, Jazz, Modern, Broadway Jazz and Hip Hop. These students can have little to no previous training to those who have been with METdance for over 3 years. See schedule and list of classes below. Our Training program, provides young dancers with a rigorous schedule comprised of technical classes, comprehensive classwork and performance opportunities to get them to the next level in their dance path. See schedule and list of classes below.